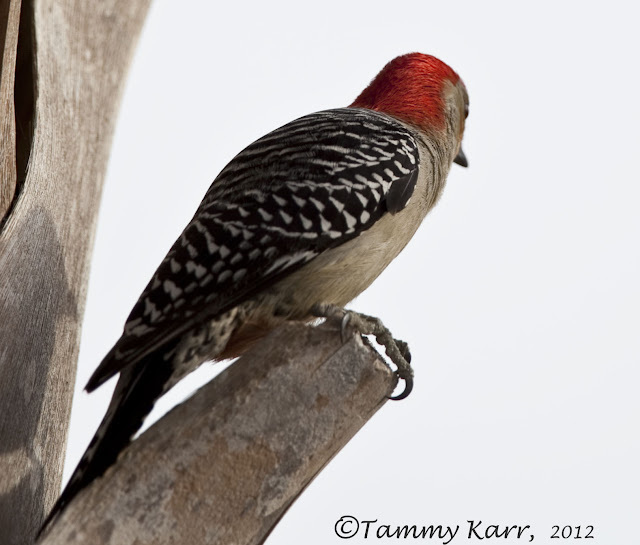 While Red-bellied Woodpeckers are a common sight in this area, I encountered an uncommon sight of one this week. As I was driving through a very busy parking lot, a speck of red caught my eye. 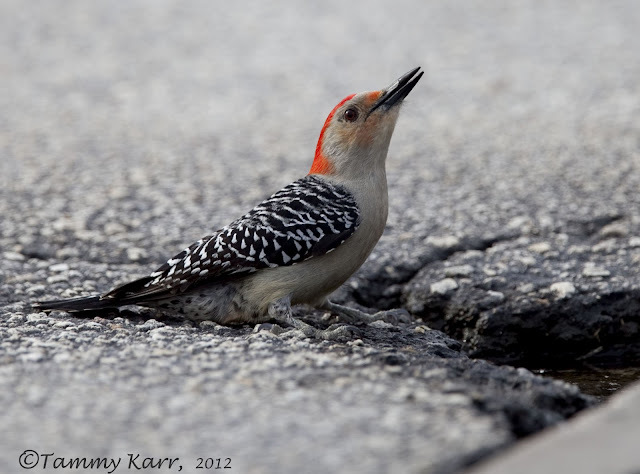 As I got closer, I realized it was a Red-bellied Woodpecker sitting in middle of the road. Enjoying a few sips of some road runoff, this Woodpecker didn't seemed fazed by the traffic. I was happy when this guy retreated to a safer location. I didn't happen to notice that until I downloaded my photos;that is quite a tongue! Tammy, I agree with Laurence, I love that last shot! Absolutely stunning little bird, and to think so many lives are ended by them being on the roads. That definitely was not a very safe place to be hanging out! I was glad he moved! That last shot really is fantastic. These birds really are fun to watch. Preciosa ave. la primera foto es espectacular. Enhorabuena!! Thank you Alan! I really like their red heads! Cool! I look forward to seeing those photos! Nice to see all these special birds at your blog. This woodpecker is amazing with his red head. Really wonderful. That first shot is stunning - the road really complimenting the plumage of the bird. Weird thing to say - but it's true! I though so too Christian! Thank you!!! No, I haven't heard that word before:) But, thank you!!! I have to say I've never seen a woodpecker of any kind in the road. That's a great shot, Tammy! 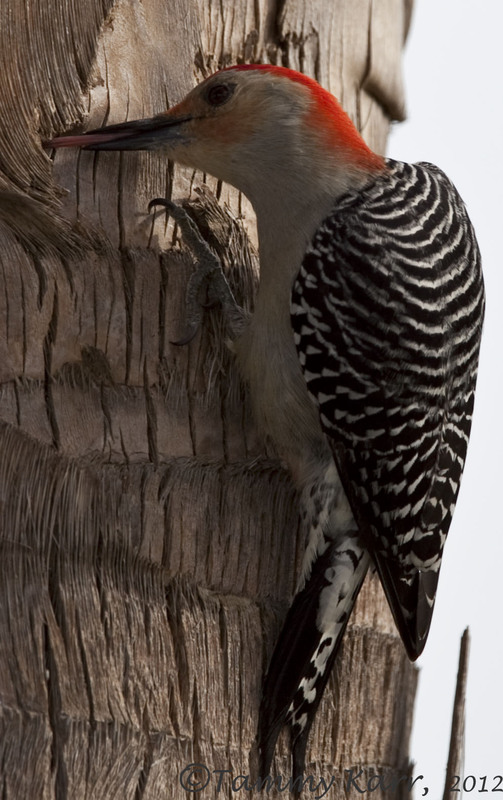 We have a pair of Red-bellied Woodpeckers that visit the feeders. They're beautiful birds. Thanks Brian! I'm glad you have some that visit; the bird feeder sounds like a safer and healthy location! I have come to the conclusion Tammy, all of your birds out there must be tame, thats very close. A great set of shots, what a looker! This guy didn't seem to fearful; thanks! Thanks for your comment....i apreciate this very much. so i will follow it with pleasure. Hola Tammy maravilloso blog las aves son de una belleza impresionante enhorabuena espero que podamos compartir este amor por la naturaleza,un abrazo desde Pamplona España,añadire tu blog a mi lista de amigos y asi sabre cuando realizas algun reportaje. Those are the type of moments one remembers. Beautiful photos! Precioso y muy significativo ese color rojo.